If you can play basic chords you know enough to begin playing fingerstyles. This programme looks at the basic techniques required to develop fingerstyle skills. There are five major instrumental studies to work through including country, classical and blues. Each style study is broken into small sections allowing you to learn quickly and efficiently. Each piece is demanding, but great fun to play. 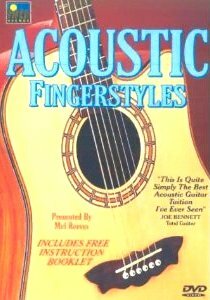 The final section looks at styles & techniques used by leading players of acoustic guitar.